Making your own mayonnaise is easier than you might think. 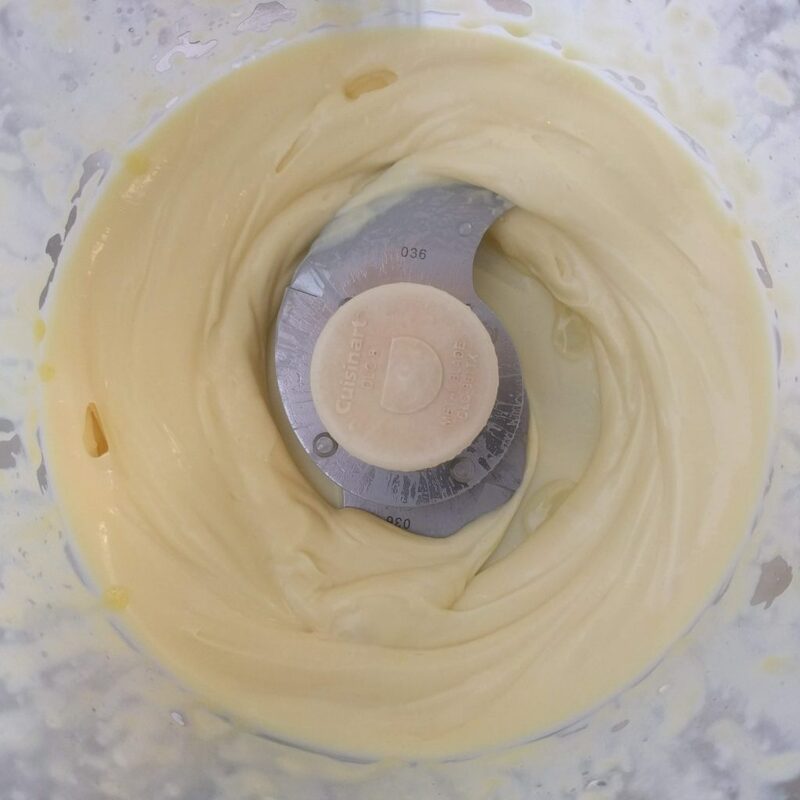 If you have the right equipment and the ingredients ready, you can have homemade, delicious mayonnaise in less than five minutes. 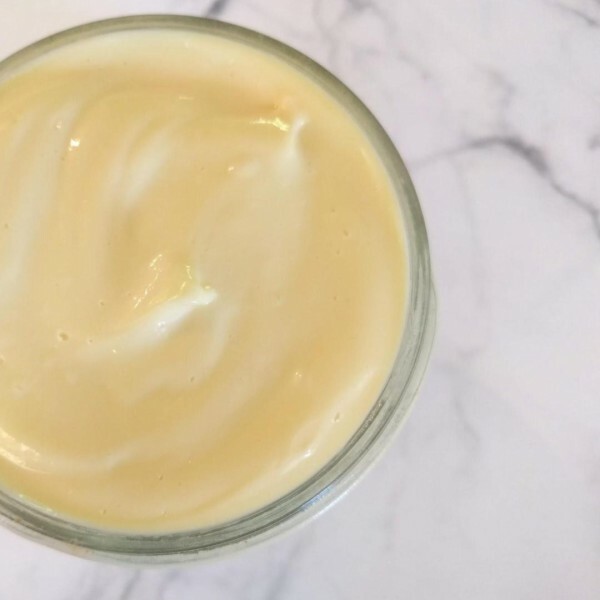 BONUS…there’s no waste involved because this homemade mayo recipe uses the whole egg (not just the yolk). And extra bonus…we use avocado oil for a healthy mayonnaise recipe that you’ll love. I like making things from scratch that are readily found in the store. Call me crazy, but I think it’s fun. Often, it even saves money. It is also healthier to make things from scratch since you have total control over what goes in, and what stays out. You’re able to avoid preservatives, fillers, artificial flavorings, unhealthy oils, and allergens (if desired). If you haven’t already, you should check out this post: 12 Things You Should Know Before Cooking Your Next Meal. I bet you’ll learn something about which oils are best to use for different purposes. Over the last few years, I’ve made mayonnaise from scratch with the following equipment. A whisk – This method works, but takes some muscle and patience. 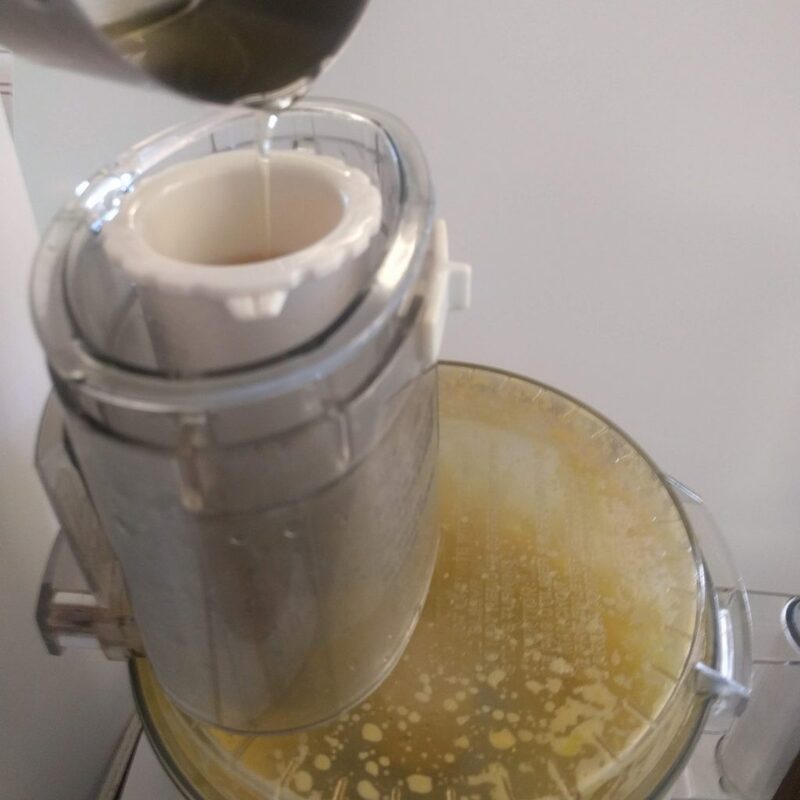 An immersion blender – This method has been hit or miss for me, but my sister recently had good luck with it. A food processor with a “pusher” – This is my preferred method that I’ll cover today. We use our food processor a lot, and this is one of my favorite ways to use it. If you have a food processor with the pusher, this will be incredibly easy. I didn’t know this for several years, but the pusher has a tiny hole in the bottom of it that works perfectly for what we’re about to do. No matter what equipment you use, the process is the same. When you combine the vinegar (in our case, lemon juice and mustard) with egg and very slowly add the oil, the egg yolk works as an emulsifier and binds the vinegar to the oil. The key is to add the oil very, very slowly. Pretty straightforward, right? Right. Here we go. First, gather your food processor and your ingredients. If you’re not sure what a “pusher” is, it’s the white thing that the oil’s being poured in in this picture. It’s used to push things into the bowl to be processed. Hence, the name. The reason this recipe is so simple is because of the tiny hole in the bottom of the pusher. If your food processor doesn’t have a pusher with a hole, you can still make mayonnaise – don’t worry. Keep reading. 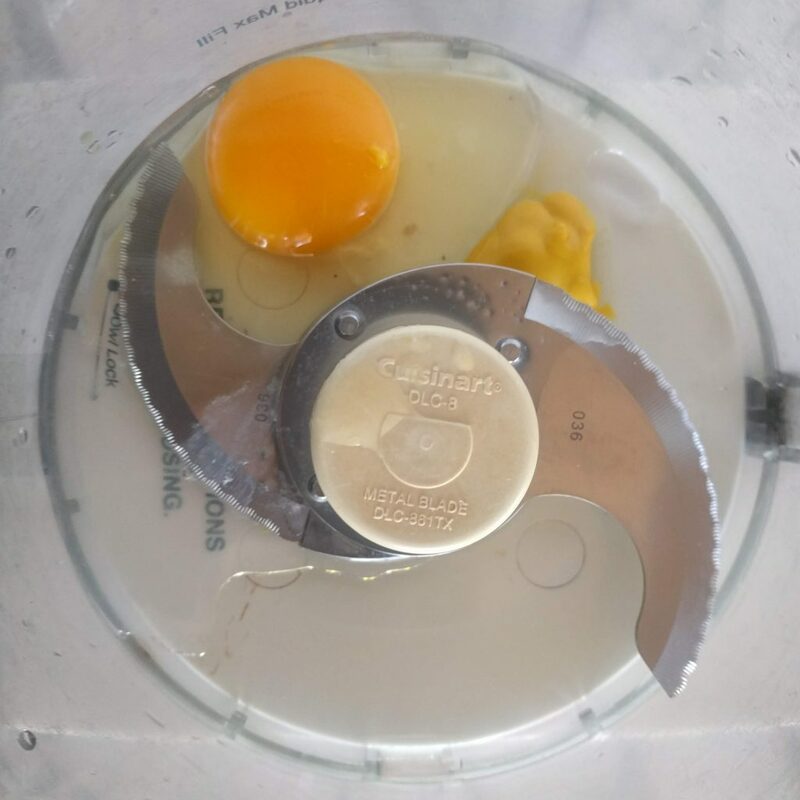 Crack the egg and add the mustard, lemon juice, and one tablespoon of the oil into the bowl of the food processor. Note: Use the highest quality and freshest eggs you can find when you’re making this mayonnaise. Also, I’d steer clear of vegetable oils if you can help it. Some recipes I’ve used in the past only use the egg yolk. When I used those recipes, I usually ended up forgetting about the egg white in the fridge and then it went bad. Even though I had the best intentions of using it in my next egg scramble. I know you’ll love this whole egg mayonnaise recipe. Yay for not wasting food! Now, put the lid on and turn on the food processor for about a minute. You just want everything to be mixed well. The consistency will be pretty thin at this point. It’ll thicken up in the next step. 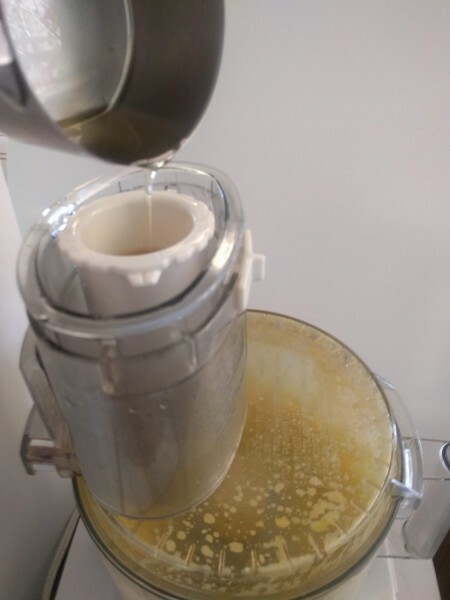 If you have a pusher with a hole in it, just turn on the food processor and start pouring the oil into the pusher. The oil will slowly drizzle into the mixture and will thicken in just a couple minutes. You’ll probably need to pour the oil in two batches, since the pusher doesn’t hold a full cup of oil (at least mine doesn’t). If your food processor doesn’t have a pusher with a hole in it…don’t worry. 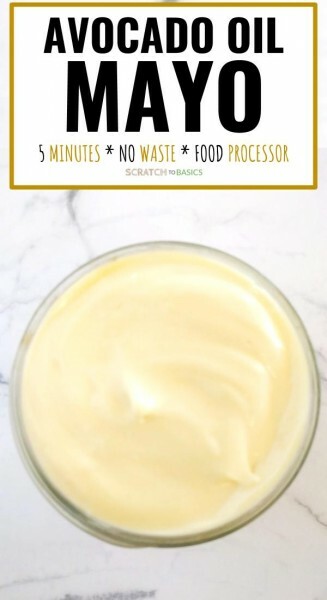 I made mayonnaise many times before I realized the magic of the pusher. All you have to do is slowly pour the oil in with the food processor running. A few drips, then pause the pouring to let it mix together…then a couple more drips, repeat. Once it starts thickening, you can slowly pour a very thin stream of oil in until all the oil is incorporated. Once all the oil has dripped through, you can turn the food processor off. Open the lid, and look at your thick, delicious mayonnaise. Yum! You can scoop it into a container and keep it in the fridge for a week or two. This recipe makes a little over a cup of mayonnaise. I usually store it in a mason jar, like this one. You can customize this mayonnaise in many different ways. You can add spices and herbs to make it even more flavorful. Or use it as a salad dressing base. One of my favorite ways to use it is to add roasted garlic and herbs. Here are five other simple ways to turn mayonnaise into more. I’ve successfully doubled the recipe, just follow the same process and enjoy! 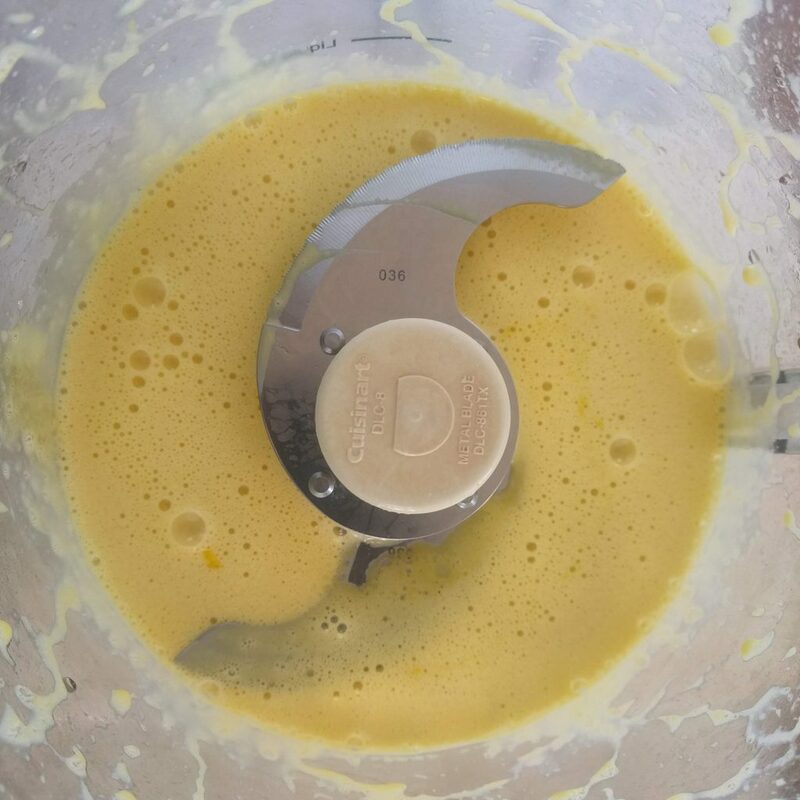 In the bowl of your food processor with your “S” blade, add the egg, one tablespoon of the oil, mustard, and lemon juice. Turn the food processor on for one minute to combine the ingredients. The mixture will thicken. When all the oil has been incorporated, turn off the food processor. Add salt, to taste. You can add more lemon juice, or mustard if desired. *Egg – Since this recipe uses a raw egg, it’s best to use the freshest eggs possible, from the healthiest chickens possible. *Oil – In my experience, a mild flavored oil is the best choice for mayonnaise. I’ve used extra light olive oil, or avocado oil with good results. You can use a stronger flavored oil, but your mayonnaise will taste like it.